Have a killer time playing with dolls this Halloween dressed in this Seed of Chucky Classic Child Costume. 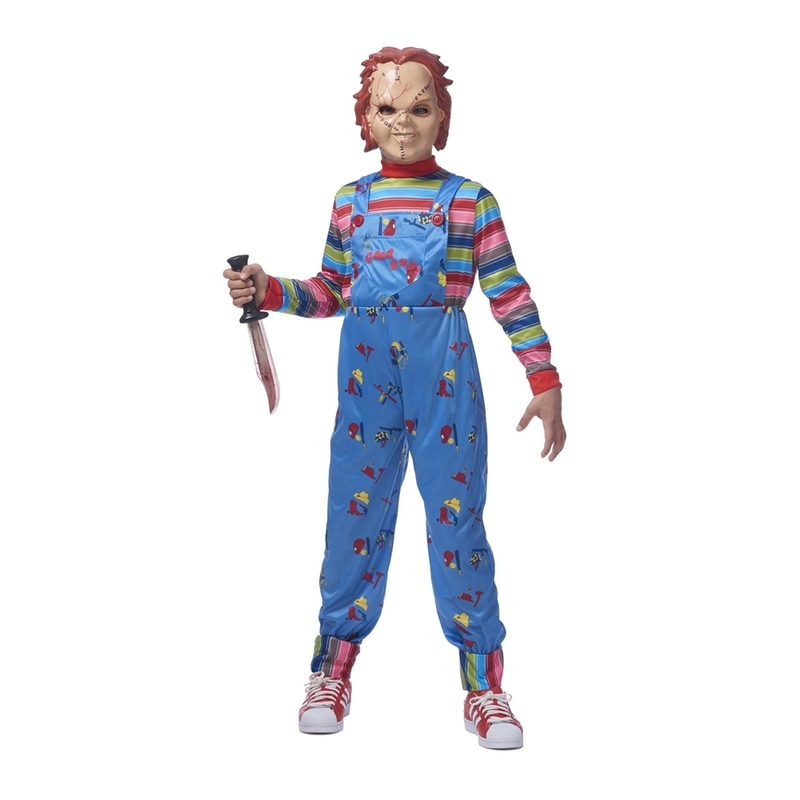 Molded after the murderous, psychopathic doll from the Child’s Play horror movie franchise, this 2-piece child costume includes a Chucky jumpsuit and mask. Made of 100% polyester, the costume jumpsuit features blue overalls with an attached multi-colored shirt. The blue overalls are detailed with faux red buttons on the front, a front chest pocket with the words “Good Guys” screen-printed in red, attached faux overall shoulder straps, and features printed themed designs that include cowboys, doctors, firemen, baseball players, construction workers, soldiers, and Indians. The plastic half mask features an elastic black band for securing in place. The mask is molded with facial features matching Chucky-etched cracks, molded silver staples, and red hair. Be someone’s friend ‘till their bitter end in this Seed of Chucky costume. Hand wash cold separately, Only non-chlorine bleach when needed, Line dry, Cool iron if necessary.